We are a highly skilled team and provide comprehensive dental care, from routine exams and cleanings to restorative and advanced cosmetic dental procedures. We attend lectures and conventions to stay current with the changes and latest recommendations for our profession. We are accepting new patients. 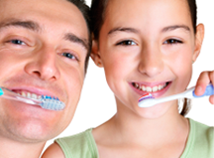 We invite you to call today so we can take care of your dental needs. We are conveniently located in St. Joseph and serve patients from all surrounding communities. Please call and schedule your appointment with us. We look forward to serving you! We offer several payment options designed to make paying for your treatment as convenient as possible. We accept cash, checks and credit cards and can also help to get you set up with an affordable monthly payment plan such as CareCredit. CareCredit is often a great solution as it offers instant approval, very competitive rates, and often has no interest or low interest financing options. We also accept payment by a variety of insurance providers: Delta Dental, Blue Cross/Blue Shield, Metlife, Cigna, Preferred One and Aetna. Our receptionists at the front desk willingly work with patients and submit all insurance claims. If you have any questions, please call so our staff can help you!